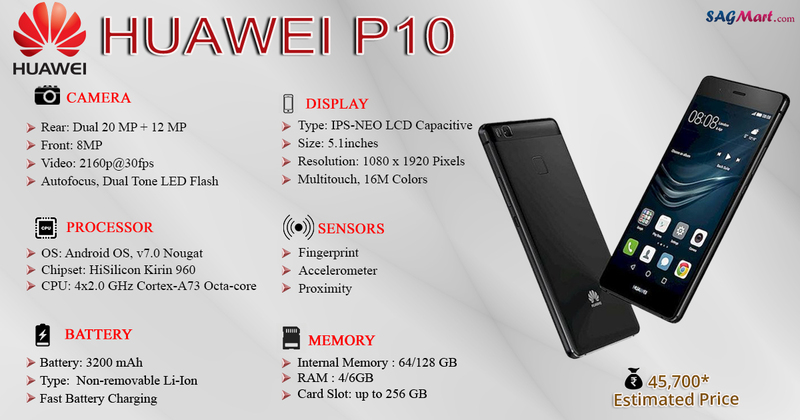 Huawei P10 comes with fingerprint sensor and Dual rear camera. The device is powered by a Octa-core processor along with 4GB of RAM and 64GB internal storage, expandable up to 256GB using microSD card. The Dual SIM device runs on the Android Nougat v7.0 Operating System and 5.1-inch Full-HD capacitive touchscreen display. It houses 3200mAh Non-removable Li-ion Battery with fast charging and spots a 20 + 12-megapixel Dual rear camera along with 8-megapixel selfie shutter. On the connectivity front, it offers 4G LTE, 3G, Bluetooth v4.2, USB Type-C, Wi-Fi 802.11 a/b/g/n/ac options.